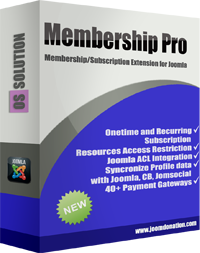 Membership Pro is the most powerful, features rich, easy to use Joomla! membership/subscription extension. It has everything you need to create and sell subscription plans, manage subscriptions and give subscribers access to restricted resources (paid content) on your website. Create and sell any type of subscription plan to meet your business requirement. Support both free and paid subscription plan. Subscription Expiration: After a specified period of time (Days/Weeks/Months/Year) or on a fixed date (example 31-12-2019) - not depends on the sign up date. One time subscription (manual renewal) or recurring subscription (automatic renewal). For recurring subscription plan, you can also set up trial price and trial duration. Trial unique memberships: Once a subscriber used up the trial he can't renew it or subscribe again to the plan. Renew Options to allow subscribers to renew their subscriptions. Upgrade Options to allow subscribers to upgrade/downgrade his subscription to a higher/lower level subscription plan (for example, from Basic to Pro membership)..
Monetize your content by giving access to restricted resources(menus, modules, articles, K2 items, urls, documents...) to paid subscribes only. Restrict access to anything on your site using Joomla core ACL method. Restrict access to individual Joomla! article or all articles from certain categories. Restrict access to individual K2 item or all items from certain K2 categories. Restrict access to individual page or all pages from certain categories created by SP Page Builder extension. Restrict access to any pages on your site using Membership Pro URLs Restriction plugin. Use Downloads Manager plugin to give your subscribers download files/documents added for each subscription plan. Create custom fields to collect any information you want from your subscribers. Each custom field can be assigned to all, one or several selected subscription plans. Conditional Fields: Show/hide a field base on selected option on a another field. Custom Fee Fields: The price which subscribers have to pay for the subscription can be calculated based on what they choose on registration form. Joomla! user groups integration: Assign subscriber to certain Joomla! user group(s) depend on the option(s) he chooses on a custom field. View and update profile data. See list of subscription plans he subscribed to, when it's started, and when it will be expired. See subscriptions history, download invoices for his payments. Choose from one of renew options(if available) and process renewal. Choose from one of upgrade options (if available) and process upgrade/downgrade membership. Update credit card data for recurring subscriptions. See restricted resources which are available for his subscriptions and access to the item they want. (articles, documents, k2 items, pages....). Manage subscriptions from both frontend and backend of your site. List, Filter, Search for subscriptions. Add, Modify, Delete, View subscription. Export/Import subscriptions into/from CSV/Excel file. Resend confirmation email to selected subscription. Assign subscribers to selected user groups when they subscribe for the plan. Remove subscribers from selected user groups when their subscription expired. Base on the assigned user groups, you can use powerful Joomla! ACL to control what they can access, what they can do (add/edit/delete items) on your site. Support most popular frontend frameworks: Twitter Bootstrap 2, 3, 4 and UIkit 3. 5 layouts options to display subscription plans: Default (list), Columns (grid), Pricing Table, Pricing Table Circle, Pricing Table Flat. 2 layout options to display subscription form: Default and Columns. Create coupon codes to give your users discount when they subscribe/renew/upgrade their membership. Coupon can be assigned to all or selected subscription plans. For recurring subscription, discount can be applied for first payment or for all payments. Limit total number of times a coupon can be used. Limit number of times a coupon can be used by one subscriber. Batch Coupons Generation: Allow generating any number of coupons with single click. Setup tax rules to charge tax for subscriptions. Taxes in Membership Pro is very powerful and flexible. In the simplest setup, you can have a single/ flat tax rate for the whole system. Each subscription plan can have it own tax rate (you can even disable tax for the plans you want). You can setup diffirent rate rate for each country/state. Fully support EU Tax Rules. You just have to do a single click and Membership Pro will setup all necessary tax rules to make it compatible with EU Tax Rules. Configure your favourite payment gateways to receive payments from members's subscriptions. The most popular payment gateways: PayPal, Authorize.net (AIM), Eway, Worldpay and Offline Payment plugins come with the extension by default. Right now, there are only 5 payment plugins support recurring subscription: PayPal, Authorize.net (AIM), PayPal Pro, Stripe and Mollie. There are only 4 payment plugins allow subscribers to cancel recurring subscription directly one your site: PayPal Pro, Authorize.net (AIM), Stripe and Mollie. Confirmation Emails sent to subscribers when they subscribe for a plan or their registration is approved by administrator. Notification Emails sent to administrator when a subscriber update his profile in the frontend. Pre and Post reminder emails sent to subscribers before/after their subscription is expired so that they can be aware of the expiration and renew their subscription. All email messages are configurable, you can edit these messages using your favourite Joomla! WYSIWYG editor. Emails sent from the system can be logged and viewable via Tools -> Emails Logs. Support displaying, searching for subscribers from one or all subscriptions plan like a members directory. Administrator can configure what fields to be displayed on Members List and Members details page. Subscribers can choose to opt-in themself from this list. We could be proud to say that we have the smartest solution for multilingual in Joomla. If your site is a multilingual website, you can translate everything in membership pro (categories, plans, form fields, email messages, language items...) to all the languages use on your site. Support synchronizing subscriber's data with Joomla! user profile, user custom fields and third party extensions includes: Community Builder, Jomsocial, EasySocial, EasyProfile. Allow assigning subscribers of each subscription plan to selected mailing lists in ACYMailing and Mailchimp so that you can send newsletters to subscribers whenever you want. Organize your subscription plans cross infinite categories and subcategories. Generate and send professional, customizable invoices PDF to subscribers for their paid subscriptions. Execute custom PHP code after subscription created, become active and become expired using PHP Script plugin. Option to limit number of subscriptions available for purchasing for a subscription plan. Third party developers have developed plugin to support affiliate tracking for Membership Pro: Affiliate Tracker and iDevAffiliate. Generating and allow subscribers to download member cards for each subscribed subscription plans from user profile. Option to create subscription for user automatically when user account is created via Joomla! user registration or management. Force visitors to register via Membership Pro when try try to register via Joomla, Community Builder, JomSocial or EasySocial. Import/Export Subscriptions/Coupons from/to CSV/Excel file. Migrate data from other dis-continued membership extensions: AEC, Akeeba Subscriptions. Allow updating to new version of Membership Pro redirectly from administrator area of your site. This plugin allows you to use Sagepay payment gatewayÂ for processing payment in Membership Pro extension. This plugin allows you to use Moneybookers payment gatewayfor processing payment in Membership Pro extension. This plugin allows you to use Alertpay payment gatewayfor processing payment in Membership Pro extension. This payment plugin in allows you to accept payments via Authorize.net SIM (server integration method)payment gateway in Membership Pro extension. This plugin allows you to use Securepaypayment gatewayÂ for processing payment in Membership Pro extension. This plugin allows you to use Payflow Pro payment gatewayÂ for processing payment in Membership Pro extension. This plugin allows you to use Moneris payment gatewayÂ for processing payment in Membership Pro extension. This payment plugin in allows you to accept creditcard payments via Monsterpay (http://www.monsterpay.com/)Â in Membership Pro extension. This plugin allows you to use EwayRapid 3.0Â payment gatewayÂ for processing payment in Membership Pro extension. This plugin allows you to use WorldPay (http://www.worldpay.com)ÂÂ payment gatewayÂÂ for processing payment in Membership ProÂÂ extension. This plugin allows you to use iDeal Mollie payment gateway for processing payment in Membership Pro extension. This plugin allows you to use PagSeguro (a Brazil payment gateway) payment gateway for processing payment in Membership Pro extension. This plugin allows you to use Stripe (https://stripe.com/) payment gateway for processing payment in Membership Pro extension. This plugin allows you to use Payfast payment gateway (www.payfast.co.za) for processing payment in Membership Pro extension. This plugin allows you to use Braintree payment gateway (https://www.braintreepayments.com) for processing payment in Membership Pro extension. This plugin allows you to use CCAvenue (http://www.ccavenue.com) payment gateway for processing payment in Membership Pro extension. This plugin allows you to use CardSave (https://www.cardsave.net/) payment gateway for processing payment in Membership Pro extension. This plugin allows you to use First Data Connect Gateway (http://www.firstdata.com/product_solutions/ecommerce/global_gateway/index.htm) payment gatewayfor processing payment in Memebrship Pro extension. This plugin allows you to use FirstData Payeezy payment gatewayfor processing payment in Memebrship Pro extension. This plugin allows you to use Netaxept (http://www.betalingsterminal.no/Netthandel-forside/Teknisk-veiledning/Overview/) payment gateway for processing payment in Membership Pro extension. This plugin allows you to use Netbanx (http://www1.netbanx.com/) payment gateway for processing payment in Membership Pro extension. This plugin allows you to use PaymentExpress PX Pay (https://www.paymentexpress.com/) payment gateway for processing payment in Membership Pro extension. This plugin allows you to use PaymentExpress PX Post (https://www.paymentexpress.com/) payment gateway for processing payment in Membership Pro extension. This plugin allows you to use PIN (https://pin.net.au) payment gateway for processing payment in Membership Pro extension. This plugin allows you to use Securepay DirectPost payment gateway for processing payment in Membership Pro extension. This plugin allows you to use TargetPay (https://www.targetpay.com/) payment gateway for processing payment in Membership Pro extension. This plugin allows you to use PayU Latam (http://www.payulatam.com/) payment gateway for processing payment in Membership Pro extension. This plugin allows you to use Sofort Überweisung (https://www.sofort.com/) payment gateway for processing payment in Membership Pro extension. This plugin allows you to use IPay88 (a Malaysia payment gateway) payment gateway for processing payment in Membership Pro extension. This plugin allows you to use Squareup (https://squareup.com) payment gateway for processing payment in Membership Pro extension. This plugin allows you to use RedSys (http://www.redsys.es) payment gateway for processing payment in Membership Pro extension. This plugin allows you to use VirtualMerchant (Elavon) payment gateway for processing payment in Membership Pro extension. This plugin allows you to use PayUmoney (https://www.payumoney.com/) payment gateway for processing payment in Membership Pro extension. This plugin allows you to use Epay (http://www.epay.dk/) payment gateway for processing payment in Membership Pro extension. This plugin allows you to use PayU (https://payu.com) payment gateway for processing payment in Membership Pro extension.